The accordion is often identified with sultry tangos and beer-soaked polkas. But a Chinese accordionist who honed her craft in Copenhagen is helping to promote the squeezebox’s potential in classical music. Hanzhi Wang last December became one of four musicians to win the Young Concert Artists auditions and the first accordionist to join the agency’s roster in its 57-year history. Unlike other noted performers on the instrument, the 27-year-old Wang has no plans to move into the crossover realm. Rather, Wang’s debut album, On the path to H.C. Andersen, to be released next month on Naxos, features four atmospheric works by contemporary Danish composers. Her summer schedule includes festival appearances with Carnegie Hall’s Ensemble Connect, clarinetist Alexander Fiterstein, and the Zorá String Quartet, as well as lectures and outreach events. And while some concert presenters have been initially reticent about booking a classical accordionist, she’ll make two U.S. recital tours in the year ahead, which YCA officials say is uncommon demand for a newcomer to their roster. Wang acknowledges that the classical accordion’s presence in North America lags behind that in Europe, where it’s taught in the major conservatories of London, Paris, and Vienna. 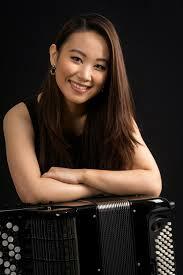 Wang remembers encountering street accordionists in her native Suzhou, near Shanghai. But the instrument truly captured her fancy when, at age five, her father was watching an Italian film on television. “There was a beautiful melody in the background and I remember thinking, ‘Wow, this is such a different sound than any instrument that I heard before,’” Wang recalled. Upon discovering its identity, she immediately asked for one. It was a “very small and cute” beginner model with eight buttons, sufficient at least for her to begin lessons with a local teacher. At age 13 she began studies at the Tianjin Conservatory. As luck would have it, Beijing’s Central Conservatory had just hired its first accordion professor, the German-trained Cao Xiao-Qing. The next year she won a spot in the conservatory’s middle school and she and her father moved to the Chinese capital. Wang earned a bachelor’s degree at the Central Conservatory, followed by a master’s degree at the Royal Danish Conservatory of Music, widely recognized for its accordion department. Next December, she expects to complete her soloist degree, which she describes as the European equivalent of a Ph.D. or D.M.A. Wang appears to have absorbed Danish culture in Copenhagen, forging ties with local composers including Martin Lohse, whose The Little Match Girl is dedicated to Wang. To promote the piece on her upcoming album, Wang shot a music video with a Taiwan-based filmmaker, in which she portrays Anderson’s fairly-tale character scampering through parks and forests. Wang has made several other whimsical videos and has recently begun a “Trip with Hanzhi,” series of travel vlogs that have so far documented sun-soaked journeys in Switzerland, Italy’s Amalfi Coast, and Croatia. Her Instagram feed offers dreamy shots of European villages and beaches along with performance clips and promotional updates. In one video she performs spontaneously aboard a KLM flight. Travels have connected Wang with a wide European accordion community, and she will talk at length about extended techniques and the relative merits of button versus keyboard accordions (she prefers the former for its range of sounds). “As a keyboard instrument with the approximate range of a Steinway grand, as well as the tone qualities of a wind instrument, it also seems to be able to make the illusion of a small orchestra,” she says.